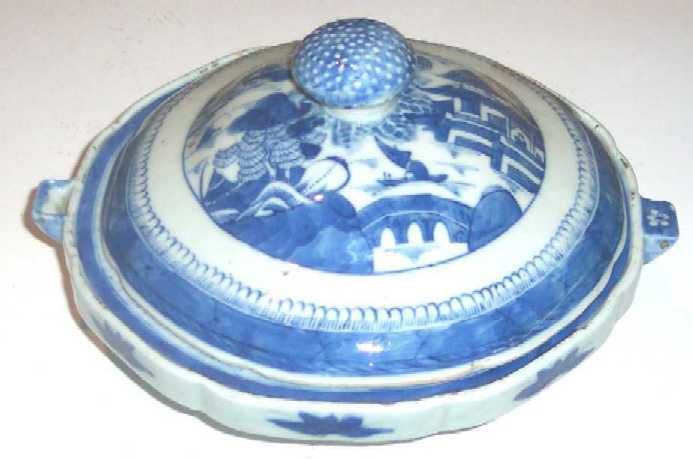 Presented here, a late 18th C. early 19th C. Chinese Export Porcelain Covered Warming Dish in the Canton pattern. Both the lid with the beautiful mushroom finial and the warming dish are decorated with small boats and pagodas in a mountainous landscape with the cloud-and-rain border. Stoutly potted, it is in excellent condition. While we often see warming dishes, rarely do we find one with a cover! The Warming Dish measures 10 inches from the water filler hole to the tab handle. With the lid on, the dish is 5-1/2 inches tall.